Carte de l'Empire de Carthage. 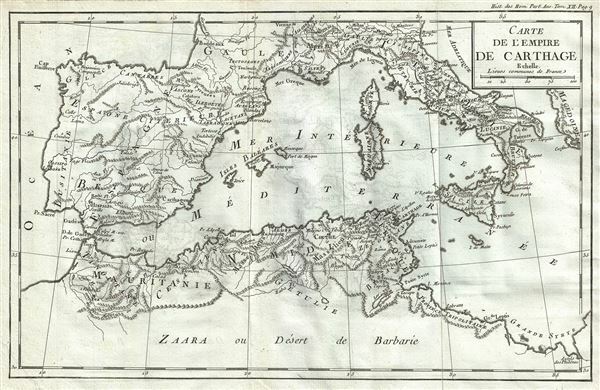 This is an interesting 1770 map by Jean- Baptiste-Claude Delisle de Sales, depicting the Empire of Carthage. Centered on the Mediterranean, the map covers from Bordeaux in France to the Province of Tripoli and includes the modern day nations of Spain, Portugal, Italy, and parts of Morocco, Algeria, Tunisia, Libya and France. Sardinia, Corsica and the Balearic Islands are also included. The map notes several important towns and cities, rivers, and other topographic details, and uses archaic place names throughout. Mountains are beautifully rendered in profile throughout. The Carthaginian Empire was formed after Carthage (identified here) gained independence from the Phoenician colonies in 650 BC. Carthage became the center for trade the Carthaginian Empire dominated much of the region, until Numidia, the Kingdom to the west of Carthage, allied itself with Rome in 206 BC leading the Roman conquest of the region in 201 BC. By the end of the third Punic war, the city of Carthage was leveled by Rome, thus ending its independent existence. Carthage's great general Hannibal, nearly conquered Rome with his highly trained war elephants, before being turned back at the very brink of victory. This map was issued as part of Delisle de Sales' Histoire des Hommes. Partie de l'Histoire Moderne. This volume is exceedingly rare as most of Sales' work was burnt under the censorship of heresy. Delisle de Sales, Histoire des Hommes. Partie de l'Histoire Moderne, (Paris) 1770. Very good. Minor wear along original fold lines. Original platemark visible. Minor offsetting. Blank on verso.